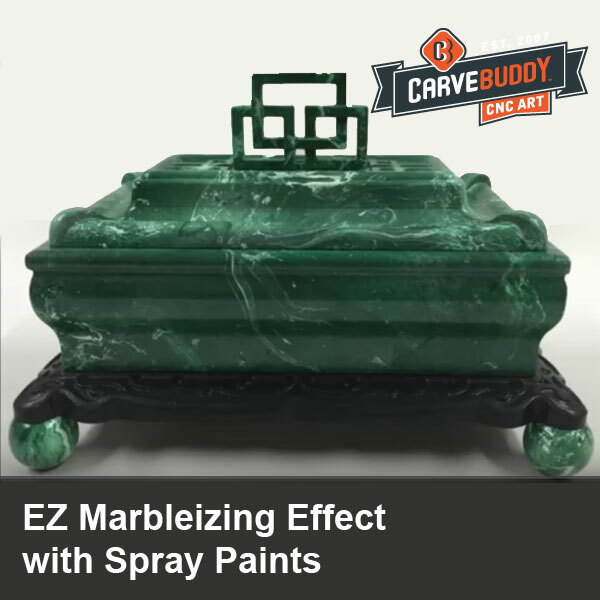 I recently had the opportunity to use Michael Tyler’s (carvebuddy.com) spray paint marbleizing technique he demonstrated at the 2017 CarveWright Conference. It’s such a fun and easy technique, that I wanted to repost his videos here for everyone to learn. This video demonstrates how to marbleize a wooden painted box top knob using a container of water and assorted spray paint colors. The same technique can be used for larger objects using a larger container. I’ll be using this same technique for a CarveWright CNC Project I designed called “The Alabaster Rose Box”. All the components are carved and cut with my CarveWright CNC machine and assembled with TiteBond III waterproof glue. The Rose Box could have been painted or stained instead (and would look really good too), but I wanted to finish the original using the marbleized technique shown in the video. Super easy and fun! This next video is a continuation of marbleizing my Alabaster Rose Box CarveWright CNC project. The first video shows marbleizing the top lid knob and this one shows the same process for the lid itself and box container. After drying overnight, I’ll apply several gloss clear coats to further the simulation of marbleized stone on this all wooden project! This Part 2 video is a continuation of marbleizing my wooden “Jade & Ebony” Box project I created for www.vectric.com. The first video shows marbelizing the handle and round feet. This video shows the same process for the lid and the box container. After allowing the marbled paint application to dry overnight, I’ll apply spray shellac and several Krylon gloss clear coats onto all the components to yield the appearance of carved and polished green jadestone!